Alonzo Bush and his twin brother Lorenzo were born on April 14, 1844 in Bernardston, Massachusetts, the fourth and fifth of nine sons of Jacob Bush (recently changed from Quackenbush) of Root, New York, and Sarah Blodget Root of Strafford, Vermont. In 1850 the family moved to Brookline, Windsor County, Vermont and bought a house on Putney Hill. Alonzo help his father on their farm and in their apple orchards. He was educated in the Round School House in Brookline. On January 25, 1862, three months short of his 18th birthday, Alonzo joined Company H of the 8th Vermont Regiment. Henry Dutton, recruiting officer for Townshend, Vermont was appointed Captain of Co. H. Other Brookline boys in Co. H included Charles A. Cutler (later commissioned), Albert H. Merrifield, Warren B. Stickney (later commissioned), Alvin G. Higgins, William W. Perry, Jr., and Marshall W. Wellman (killed in action 6/22/1862). On March 4, 1862, Alonzo departed Brattleboro with the 8th Regiment. They went by train to New Haven and took the steamer "Granite State" to New York City. The regiment was then crowded into two sailing transports, the "James Hovey" and the "Wallace" and departed for Ship Island, a small island in the Gulf of Mexico about 100 miles from New Orleans. The voyage was rough and one soldier, Enos L. Davis, 18, of Newfane died of prostration and was buried at sea. The regiment arrived in New Orleans on May 12, 1862 and Alonzo, along with Co. H was sent to Bayou des Allemands to guard the road and railroad leading into New Orleans. While there, Alonzo contracted a disease which soon took his life. 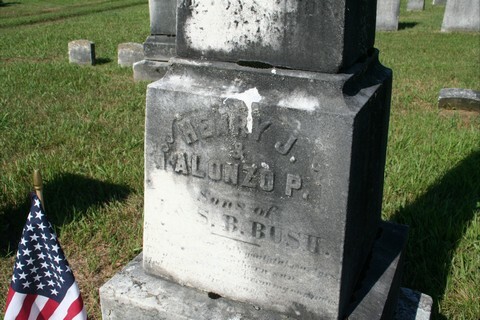 On August 26, 1862, seven months after his enlistment, 18 year old Alonzo Bush died in an army hospital in New Orleans. Captain Henry Dutton visited him daily throughout his illness. Alonzo is buried at Chalmette National Cemetery in New Orleans, grave site 5531. There is also a monument to him in River Cemetery in Brookline. Two poems were published in the county newspaper honoring Alonzo, and are included below. You wrote and asked me what I thought of you enlisting or if you want me to just say what I thought about it - whether you had better stay and work for 13 dollars and a half per month or whether you better enlist and come down here and get 21 dollars per month. Well Lorenzo, I tell you what it is. I think you had better stay where you are even if you could not get more than 10 dollars per month. If I were in Vermont and know what I know now about being a soldier, I would work for my board and clothes before I would enlist. I don't want you to think that I am homesick, for I aint, but would like well enough to get back to old Vermont. I advise you by all means to stay where you are if you know when you are well off. But I don't think you have any notion of enlisting anyhow. You wrote and asked me just to see what I would say about it. Aint that all what you wanted to know? I have told you the truth about it. I can't think of any news to write to you for I don't have ever a chance to get any news. As you might well know, this is the 7th letter I have written since I started from Brattleboro. I have wrote two to Henry but have had no answer from him. I have wrote one to George, have had no answer from him. This letter makes 12 letters since I came from Brattleboro and have had one today, the one that I got from home today. Was very glad to hear from home and to hear that you were all well. Sorry to hear that John had the kakee rash, but was glad to hear that he was not very sick. I have not got the sugar yet but was glad to hear that father has sent me some. I wrote a letter home the other day and I sent for one or two in gold if father could spare it well he can send it without robbing himself he may send it in gold. Paper money will not pass here and so I don't want that paper money. I would like the gold first rate if he feels able to send it, if not he need not send it. Perry (William W. Perry) is well and so is Higgins (Alvin G. Higgins). Higgins has gone into the band. As this sheet is getting full, I must close for this time. You must write as soon as you get this. Best Wishes. Learning from various sources that neither the letter that I wrote you or the clothing that I sent you soon after your son's death has reached you, and feeling somewhat chagrined that you should think that I had so far neglected you at a time when I know you must feel so deeply, I take the liberty to address you another, even at this late day, which I would have done before but for a few months past we have been continually on the move that I have hardly had time to attend to my business affairs. Especially within the past two weeks we have fought one quite severe battle lasting through part of two days and one entire day and have hardly been two nights in the same place. This of course was the severest part of the campaign. But this being the situation of affairs, please excuse me for not attending to this sooner after hearing that you had not received my first. Your son Alonzo had, previous to his death, been detailed for service in the Battery and was stationed with a detachment of our Regt at Bayou des Allemands some thirty miles from our Regimental Headquarters. When he returned to the Regiment he was very ill indeed and from that time I had very little hope of his recovery. I visited him daily and every thing that could be done for his recovery and comfort was done. He was at all times patient and appeared to be resigned. All in connection with the hospital at the time spoke of this, and in his favor. I am aware that these things must be both pleasant and painful for you to learn as they are for me to write. I have an affection for all the men under my command and the loss of one is the occasion for me of sorrow only less than that of the parents. I cannot see my men drop off as they do one by one without feeling as though I had lost more than a friend, a brother, or a son. We learn here, away from all our kindred and friends, away from home and its endearments, away from our former protectors, amidst trials, hardships and perils, to lean upon and depend upon one another. I know full well that I am dependent on and am protected by my men. I hope they feel the same towards me. Within the last two weeks we have been called upon to moan the loss of two more of our number. Ranson B. Miller of Westminster, and A. J. Crombley of Windham, two of my best men. Thus the horrors of war are not alone on the battlefield, but in the sick room where the patient sufferer just as heroically gives up his life for his country. Your son, while with me, was one of my best boys and was always willing to do anything that came in the line of his duty. He neither attempted to shirk any duty or any danger. Such traits are not always found in a soldier and endear them to their commanders. I never had occasion to punish him and I think not even to reprimand him. For these things, I loved him. And these traits, I am aware too, much have endeared him to his parents. But as I bore the relation to him of a kind of parent, I can, in a measure, sympathize with you, and with you moan his loss. Please then accept sympathy from me and allow me with you to moan. Tis all that I can do. I do this happily and anxiously. Here in the midst of dangers, desolation, carnage, and war, I occasionally turn my thoughts to the happy homes we have left behind us. And more sadly to those homes made desolate by friends who can never return. But they lay their treasures on the altar of their country. They have endured and suffered in anxiety at home more than we can possibly suffer in the field. 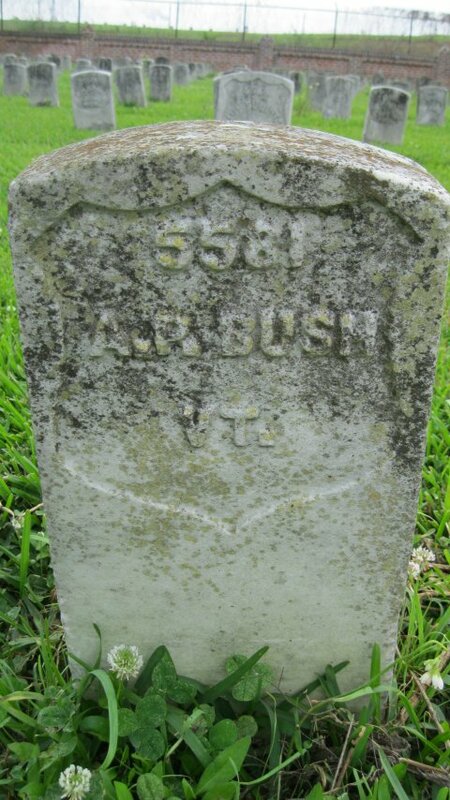 Your son Alonzo P. Bush enlisted January 25, 1862 and died August 25, 1862. He served seven months and one day. Inventories of his effects and final statements of his accounts have been sent on to Washington and you will get the pay he is due by applying there and, I presume, to Maj. Austine at Burlington, Vermont. Thou no more with us wilt be. With that faithful patriot band. May God grant thee rest above. And thy soldier's work is done. 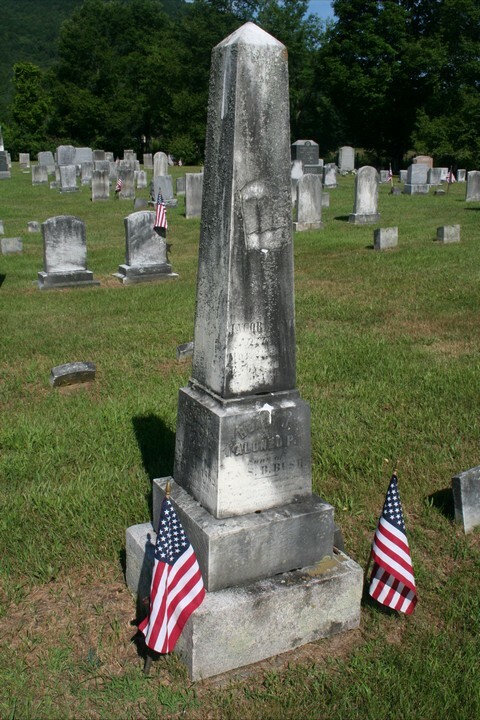 Find a patriot soldier's grave. For the soldier's camp and fare. Sought a place amid the strife. Bade him go and dare not pause. In the grave did place his clay.